COMB? CHECK. BRUSH? CHECK. BOWL FULL OF MUSH? CHECK. 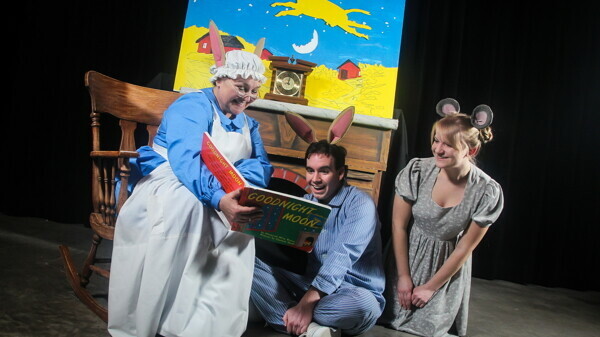 The Eau Claire Children’s Theatre is staging a musical version of the memorable children’s picture book, Goodnight Moon. Watch a popular piece of children’s literature come to life in a new and inventive way in Eau Claire Children’s Theatre’s production of Goodnight Moon, a beloved kids’-book-turned-musical. Wayne Marek, director of ECCT and many of the company’s productions, said the musical takes Goodnight Moon, a storybook with very few words, to a new level. The 1947 book, written by Margaret Wise Brown and illustrated by Clement Hurd, features the main character, Bunny, saying goodnight to the many objects in his bedroom. In the musical, the cast brings these objects to life. “For example, there’s a picture in Bunny’s room in the book of three bears sitting on chairs, so those bears come to life and the bears do a number,” Marek said. There’s also a recurring bit about a cow jumping over the moon, the popular children’s song, which Marek said he thinks the audience will enjoy. Marek said one reason they chose this particular book is because most adults as well as children are familiar with Goodnight Moon since it was so popular when they were younger and many have read it to their own children. ECCT’s mission is to allow young people to experience live theater, and Marek said this 50-minute production is an excellent way to do so. “Even if you’re not familiar with the book, it’s a great show to expose younger children to live theater because it is a little bit shorter,” he said. The seven-member cast consists entirely of adults who have been in ECCT shows before. While Marek said they do have children in their cast as long as the roles call for it, with this particular production it was thought better to have an adult cast. “It’s a group of experienced adults so this is really kind of a perfect show for us with an adult cast performing a show based on a piece of very classic children’s literature,” he said. Kevin Grady plays Bunny, and although he has been in several productions with ECCT, the all-adult cast is one of his favorite parts about this particular show because it is so entertaining.